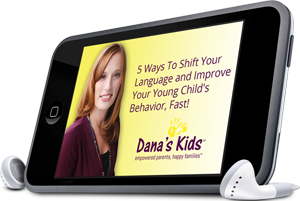 Dana’s tips for teaching appropriate restaurant behavior. Having a child shouldn’t mean you can’t go out for dinner without hiring a babysitter. Taking your young child to a restaurant holds the possibility of a wonderful experience in a new place with new foods, as well as an enjoyable time for you and your partner. It can also be a total nightmare. Here are some tips that will help you achieve the former, and cope with the latter. First and foremost, try to choose a restaurant that is relatively child-friendly. Trying to make a go of it in a strictly adult-only environment sets you and your child up for failure and isn’t fair to other diners. Birth to 4 months may be the easiest time to take a child to a restaurant. As long as there is room for your stroller or car seat, the low rumble of conversation tends to lull babies to sleep through the entire meal! Parents should consult their pediatrician and consider what best suits their child and family, when deciding at what age to bring their infant into a restaurant. Bringing babies 5months – 1 year old to a restaurant can be slightly more challenging, but they are fascinated by all of the new things around them. Use this to your benefit. To start, keep them in the stroller or car seat. Let them spend some time looking around, holding your napkin, listening to the different voices. Once you take them out they’ll enjoy gently banging on the table and exploring the booth. Remember, they’ll be quick to pull a table cloth or grab and knock over a glass so be sure to keep these things out of reach if you have your child on your lap. Have finger foods and small toys available. Give these things to your child slowly. They’ll still be interested in looking around as they eat and play. 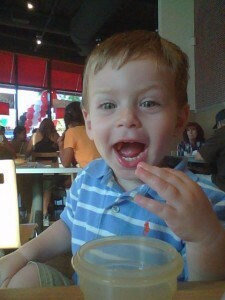 Toddlers who are 1-2 years old take a bit more planning before accompanying you to a restaurant. First of all, be sure the restaurant has a high chair or booster seat. Otherwise, bring your own. Once you sit down, clear a spot on the table for your child. Be sure that you are going to the restaurant at a time when your child is hungry. If you miss that window, it will be hard to contain your child and most likely that will ruin your meal. Acknowledge that developmentally, a 1-2 year old can not sit for a 3 hour meal. This may mean shortening your meal a bit, or feeling comfortable enough at a restaurant to follow closely while your child toddles around. Children at this age love to practice new walking and running skills. As with babies, bringing small finger foods and snacks is important. It’s best to be prepared for the possibility of a slow kitchen. Bringing toys and presenting them one at a time is helpful at this age as well. You might first offer a board book, then a crayon and paper, and finally a small peg board or puzzle. For children 2-3 years of age, putting together a restaurant bag is helpful. Children at this age can sit longer, but still need activities to keep them engaged. Some of my favorite “restaurant kit” items are stickers, paper and crayons, contact paper and collage materials, travel size Magnadoodle, books, and small cars and animals. If you are going to a nice restaurant, bring a disposable placemat or extra paper for your child to work on. Remember, pace your child by giving them one item at a time. Talk to your child about his or her day and yours, as well as the food that is coming. Think about what you might do tomorrow and what the plan is for when you get home. Choosing appropriate meal times and having snacks on hand goes a long way with age group as well. As children get older, they can help pack their restaurant bag or do it entirely themselves. They can order their food and say thank you when it arrives. Restaurant etiquette is a lifelong skill. You might play eye-spy in the restaurant or pick out letters and their sounds on the menu. Because you started bringing your child to restaurants at a young age, they will have a clear understanding of the expectations when they are older. Some parents find having a portable dvd player works for them in restaurant settings. Watching a video will certainly keep your child busy during a meal but can be a slippery slope. Sometimes batteries die. You’ll need to keep the volume low enough so as not to disturb other diners or your child has to be willing to wear headphones. Using a dvd player may shorten your child’s attention span for the other items you bring to occupy them, because they are anticipating using the dvd player. Plus, your child might miss out on what can be a terrific teachable moment. This is not to say you shouldn’t have the player available. Just choose the times at which you use it, wisely. Once children are eating solid food, give them the opportunity to try some of what you are eating. When they can speak, encourage them to say please and thank you to the waiters and waitresses. I suggest playing quiet and loud games before you go to a restaurant so that your child is clear about the difference between inside voices and outside voices. Include your child in table conversation whenever possible. To be sure, there will be days when you’ll have to take that meal to-go. There may be periods of time where you have to give up meals at a restaurant, but don’t forget to try again a month or so later. With practice and repetition your child will better understand appropriate restaurant behavior, and dining out will become a fantastic family activity! This entry was posted in Activities, behavior, developmentally appropriate, eating out, parenting, parents, quality time, teachable moments, tips and tagged behavior, developmentally appropriate, eating out with your young child, meals, parenting, restaurant kit, teachable moments, tips, young children, young children and restaurants. Bookmark the permalink.